22 more days before the National Election. TV shows, internet, radio stations, and any other forms of media (including Facebook) is brewing with discussions over this much-anticipated event. People needs to cool down and enjoy something cold this hot summer season. 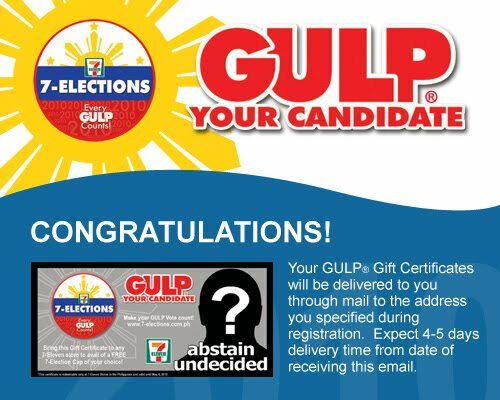 Bet for your candidate and get gift certificates from 7-Eleven for a FREE 16oz Gulp! Register HERE. You will receive an email to confirm your registration. You must click the link to validate your registration and you will receive another note confirming if you are one of the first 500 to register. The first 500 registrants within the week will get the freebie. GC's will be sent within 4 to 5 days after registration. The clock is ticking so better click that link! I registered yesterday but I didn't make it to the first 500.. anyway, was able to register this morning, and I have not chosen any candidate just yet. The promo will run until May 2, 2010 and you have until May 4, 2010 to claim the freebie. This is valid in all 7-11 branches in Luzon.